My wife Sherri and I live in Minnesota with our 36 dogs with puppies on the way, a cat and Pig named Petunia. For many years we lived in a remote, off-the-grid cabin. A few years ago Sherri told me "This is the last winter that I am going to spend in this cabin.” I built a more modern house closer to town. I must admit that I enjoy the indoor toilet and shower. Like many mushers, the dogs are a big part of our lives, raising, training and caring for them. We love racing, but that's not really why we do it. In a world that seems to be more and more chaotic, our dogs are the constant for us. In 1998 I was leading recreation programs for a park district near Minneapolis. A guy at a sporting goods store, Hoigaards, asked if I would help him set up a skijoring program, a way of skiing with dogs pulling, at one of the parks. 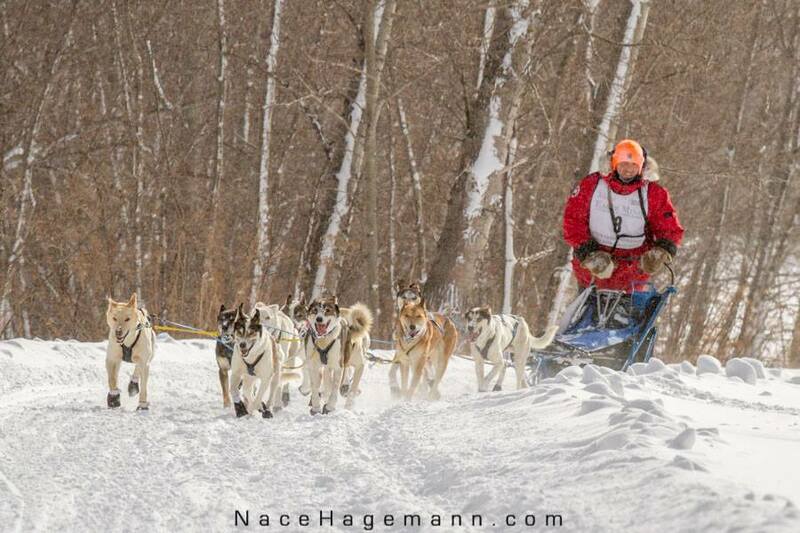 Moe cresting Brockway Mountain outside of Copper Harbor in Michigan’s Upper Peninsula during the 2014 Copper Dog 150. Photo by Brockit, Inc.
How do I describe my dogs? I've heard it said that dog teams are a reflection of their owners. Sherri says the dogs are like me: a little out of control sometimes, great eaters and love to run. We bought a few key dogs when we got started racing, and all the dogs on our racing team are descendants of those four dogs. On a run the other day I was thinking about the dogs on the team. I'd not only raised them all from pups but the three generations before. I know them all well and the greatest moments of my life now are on the trail with them. I have an ideal training schedule that I write up at the beginning of the season, but it's usually mostly fiction. The weather and now my physical limitations as much dictate the time and distance of our training runs. One thing I've learned lately is the benefit of rest and recovery. Looking back at training logs from years past, I see where I may have over-trained the dogs. I'm getting older too and taking a few days off now and then is just reality for me. The dogs seems to do better too. Moe, a former Minnesota State Representative, has been a long-time advocate for environmental issues. In March, 2012, he gathered 13,000 signatures petitioning against sulfide mining and the pollution produced by these mining practices and mushed a 10-dog team 350-miles, from Grand Marais to the state capitol of Saint Paul, to deliver those signatures to the governor. His adventure was documented in a film called “Sled Dogs to Saint Paul: the Race for Clean Water,” and Moe authored a book by the same title. If you’d like to check out the book, click here. Luckily here on the North Shore of Lake Superior, the off season is pretty short. It rarely gets into the 80s and morning in the 40s can happen even in July. I've trained dogs every month of the year, but I don't train them much in the summer. We do live in the woods surrounded by hundreds of acres of private land owned by mushers and thousands of acres of public land, so free running is pretty easy too. Moe with his team in the 240 mile U.P. 200 in Michigan’s Upper Peninsula, in 2015. Photo by Nace Hagemann. After 20 years of mushing, with 15 of those being competitive racing, Sherri and I still love it. We wake up every morning and look out the bedroom window at our dogs and are grateful for this life with them. I've considered scaling back on my racing some, and no longer do the Beargrease Marathon, but we did run it again in 2019, finishing 8th in what most think were the worst weather conditions the race has ever seen. We are now also okay with scratching or dropping from a race if we or the dogs aren't up to it. We have to have fun or what's the point? It's still hard work, but if I didn't have sled dogs, I don't know what I'd do with myself.